Adhémar and Jacobi and the Missing Model Locomotive. Adhémar (a small lion) and Jacobi (a little monkey) travel from the jungle in the Democratic Republic of Congo to Europe to recover a vintage model locomotive that disappeared from the home of a little boy in Paris. Adhémar (a small lion) and Jacobi (a little monkey) travel to Paris from the Democratic Republic of Congo to help Inspector Rocard from the Quai des Orfèvres recover the beloved vintage model 2025 steam engine that disappeared from the home of little Alain Jospin. They are hot on the trail of a dishonest Central European model train dealer, Zoltan Gromek, and follow him to Antwerp, Belgium. This colorful, fast-paced story, will delight young listeners and open their minds to the world. Weekly 4 minute binge of musical rarities, oddities and classics, this time "School's Out" with Connie Francis, Chick Berry, and yes, Alice Cooper. Special cameo from Mr. T.
Weekly 4 minute dash through musical oddities, rarities and classics, this week it's Dreams with Enrico Caruso, Ella Fitzgerald and (yikes) Katy Perry. New music from Chibi Kodama and Human Tim + Robot Tim, plus so very much more! TMBG - Don't Spare the Rock! Piano music inspired by children, by Debussy, Schumann and Faure. Piano music inspired by children, including Debussy's "Children's Corner Suite," Schumann's "Kinderszenen" ("Scenes from Childhood"), Faure's "Dolly Suite," and Poldini's "Poupee valsante" ("Waltzing Doll"). Complete script with playlist available here and at www.compactdiscoveries.com. This program was originally distributed nationally by the WFMT Radio Network in 2003. Its re-editing and re-release in 2007 were made possible by a grant from the National Endowment for the Arts and the PRX Reversioning Project. Classics for Kids is a fun introduction to classical music for kids of all ages. Each month focuses on a different composer. In October 2013 it is Igor Stravinsky. In this second program for the month, host Naomi Lewin tells the story of Stravinsky's ballet, The Firebird. Classics for Kids is a fun introduction to classical music for kids of all ages. Each month focuses on a different composer. In April 2013, it is Frederic Chopin. In this first program for the month, host Naomi Lewin tells the story of Chopin and his music, complete with many musical examples. The Waltz takes center stage. Classics for Kids is a fun introduction to classical music for kids of all ages. Each month focuses on a different composer. In May 2013, it is Johan Strauss Jr. In this third program for the month, host Naomi Lewin explains how the the waltz, which was popular on the dance floor in the 19th century, moved onto the concert, ballet, and opera stages. each week for Tell Us A Tale! "Goldilocks and the Three Bears" and "Green Eggs and Ham"
A third grader recounts the story of two second graders, a bus ride and a scary book. "You are about to hear the most horrifying story of your life." So begins Hannah?s tale of two eight-year-olds, a school bus ride and a scary book which they could not stop reading. 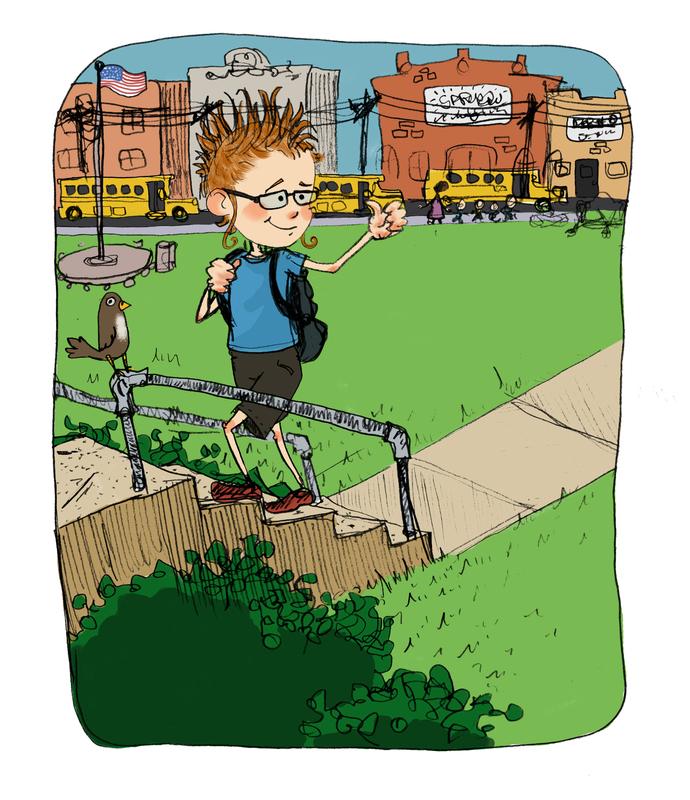 This story was originally part of a site-specific audio tour of our school written and recorded by third graders. The stories recount school memories ranging from kindergarten to third grade which reference specific locations, landmarks and objects on campus. While these pieces were originally created to be listened to on-site, they can be enjoyed on their own as well. We also recommend that you listen using headphones. Third grader William remembers the extraordinary time in first grade when he lost two teeth in two days. Not one to sit around, William took matters into his own hands when his loose teeth refused to fall out on their own. This story was originally part of a site-specific audio tour of our school written and recorded by third graders. The stories recount school memories ranging from kindergarten to third grade which reference specific locations, landmarks and objects on campus. While these pieces were originally created to be listened to on-site, they can be enjoyed on their own as well. We also recommend that you listen using headphones. Beat boy of Murray is a product of baskhaus radio group. The art excursion was themed "That Sound," and pitched to visual artist Joe Duncan for a trade much like visual artists do regularly. BRG cofounder and producer Rebecca Feldhaus Adams recorded and produced the first round of the exchange. Duncan, a print-maker, graphic designer and all around artistic force based in Denton, TX answered. Duncan started the second round, and the third is a double blind. Listen in on soundcloud and at baskhaus.org. For the first time in media history, kids from Europe and America have their own intercontinental radio and web channel now: "Across the Ocean". Made by kids for kids on both sides of the Atlantic. Educative, participative, entertaining. From the grassroots, free of commercials. All age groups: from 3 to 20 years. All topics for kids. All year round - every year. And: Every public or community radio station, every school, every youth initative can actively join the Transatlantic Radio Bridge! Check out: www.across-the-ocean.org. You can also check pieces on www.across-the-ocean.org and mail us your preferences for upcoming productions! * Youth from Illinois and Berlin talk about ideas how to prevent climate change via internet! * Fourthgrade Kids with learning disabilities from Berlin present their rap about waiste reduction! * Kids from Berlin present a magic circus where they learn how to save our Earth on a daily basis! The first episode of a kids' "spacecast" focused on the wacky, outer space adventures of the fictional Beams family! The Beams Are On! Welcome to the galaxy's first "spacecast" broadcast live from a Super Satellite 750 million miles from Earth! The Beams! is a radio show co-hosted by 10-year-old Brenna Beam and her 8-year-old brother, Baxter. The Beam kids discover a way to transmit to Earth while their genius scientist parents work on top secret projects. 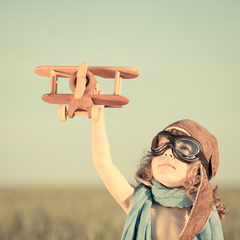 And that's where the adventures begin... Produced with professional actors and high-quality sound effects, The Beams! "fills the space between kids' ears" with fun and imagination not heard since the radio dramas of the mid-twentieth century. In the 30-minute pilot episode of the The Beams!, Earthlings aged 6-12 will meet Brenna and Baxter, their lovable robot, Comet, and a cast of wacky outer space characters that includes a saucy cook named Doreen, everyone's favorite house band, The Rock-Its, and the evil (and perhaps misunderstood) satellite patroller, Mudge. The pilot episode has six chapters ranging in length from 2-9 minutes long. Fans of the show can visit our web site at TheBeamsAreOn.com to get bonus audio material, download Comet's "Trade-a-Joke" cards, and even send email to Brenna and Baxter. For more information on The Beams!, please contact Jenny Mirken, Executive Producer, Space Radio Productions LLC, at 617-460-1906 or jmirken@hotmail.com. 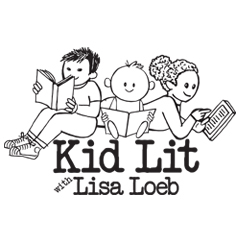 Kid Lit with Lisa Loeb is a half hour program for public radio celebrating the best in children’s literature. speaks with iconic children's book author, illustrator and songwriter, Sandra Boynton about her CD and illustrated book Frog Trouble . Lisa McMann talks about her series The Unwanteds described as "Harry Potter" meets "The Hunger Games,"
#1 New York Times bestselling author of the Fablehaven and Beyonders series Brandon Mull discusses his adventure series Five Kingdoms . finds out about "New Adult," a new age category, that's exciting readers and publishers.